The number of instances was a little bit low. These results are strongly suggestive of upside over the next few days, though. 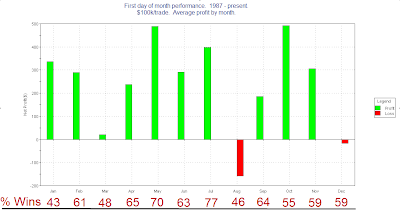 The profit factor (gross gains / gross losses) over the first 3 days is especially impressive. Also compelling is the fact that every instance saw at least 1 close above the trigger day close within the next day or two. The last hour rally has been common lately. The last hour is often viewed as the “smart money” hour, when institutions place many of their trades. Some indicators track either just last-hour movement or 1st hour and last hour. While the market has consolidated the SPY has moved up in the last hour for 4 days in a row now. I looked at other situations like this. Strong moves in the last hour are often interpretted as bullish. My rather simple test here shows no evidence of that going forward over the next week. I intend to explore the last hour concept in greater detail in the future. One observation I explored last night was the fact that volume is decreasing not only since the March bottom, but on a year over year basis as well. July volume appears likely to come in lower than in 2008. Since the long-term trend of volume has been steadily up I decided to look at other times the market’s monthly volume had declined on a year over year basis. There were 543 months in the test and the average month gained a little over ½%. There have been 125 times where volume has come in lower than the same month the year before. Results following such months were in line with all months as a whole. I also checked to see if it mattered whether the month was positive or negative, or whether it closed at the highest monthly level in 6 months made any difference. Somewhat surprising to me, I was unable to decipher any edge, bullish or bearish, to a year over year decline in volume. Also notable from Friday afternoon is the fact that new highs contracted substantially while the S&P made a 50-day high. The percentage of stocks hitting new 52 week high dropped from a little over 7% on Thursday to under 5% on Friday. I looked at other times the SPX made a 50-day high while the drop in new highs equaled 2% or more of the total issues. What I found interesting and compelling about the above test was NOT the size of the average decline. In fact that was somewhat weak. It was the fact that 95% of instances closed below the trigger day close at some point in the next 5 days. This suggests that while the lagging new highs might not indicate an immediate selloff, the market has consistently struggled to move higher. The Nasdaq’s winning streak reached 12 on Thursday. It's all over the news. In Tuesday night's Subscriber Letter, when the streak had hit 10, I posted the following commentary. I think you may find my take a bit different than others who have examined the streak. I have seen much written about the Nasdaq’s current winning streak. As of Tuesday the Nasdaq has now closed higher for 10 days in a row. 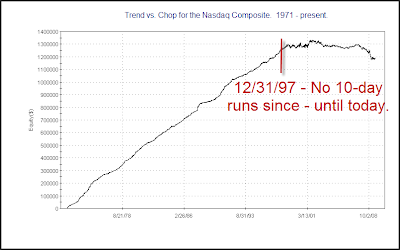 I ran a study to examine performance following such runs since the inception of the Nasdaq. These results appear to be quite bullish. Rather than just taking them at face, though, let’s give it some further thought and consideration. A closer examination of the results would show that the last occurrence was in 1997, which means it happened 26 times in 26 years and then not again for 12 years. Let’s consider what might cause this to happen and what this suggests about the above results. I’ve shown the Trend vs. Chop chart many times for the S&P 500, but never for the Nasdaq Composite. I decided to produce that for examination below. As a quick refresher, a downward moving line suggests the market is dominated by chop while an upward trending line suggests daily follow through is more prevalent. For those who would like to read more on the Trend vs. Chop concept you may click here. My inclination was that in a mean-reverting environment, results would likely be worse than those above. To this point that hasn’t proven to be the case. I’m still expecting some short-term weakness, though. I’ve added a new feature on the right hand column of the blog. One thing I’ve done a poor job of over time is posting links. It seems I only manage to get linkfest posts up once every couple of months. I do read a fair amount that I believe is worth sharing, but putting together posts full of links is arduous and I rarely get around to it. Fortunately I’ve now found a way to share some of the things I find most interesting on a daily basis. The widget on the right hand side of the page titled “Other recent notable reading” contains links to the work of others. You can see the last five posts from my reader that I decided were worth sharing. For a longer history and a full view of the readings simply click “View All” at the bottom of the box. Hopefully you’ll find this new feature beneficial. Check back often as I’ll update it with fresh links as I read them. Despite the rise in the S&P 500 on Tuesday the banks (BKX) fell over 3%. Historically when the banks have fallen sharply while the S&P has risen, it has often been followed by weakness in the S&P. Below is a study that exemplifies this. Both the low winning percentages and the fact that losers were larger than winners suggest a downside edge over the next 1-5 days. One of the positives I'm seeing in the market right now is the extremely strong breadth. In the last week or so several breadth related studies have triggered that suggest more upside. Below is a study from the 2/6/09 Subscriber Letter. It was identified last night by the Quantifinder for both gold and silver subscribers. The long-term implications were strongly bullish. The very short-term was questionable, and there was often a bit of a pullback at some point early on. I was on vacation last week with limited access to the internet. While subscribers still got the nightly Subscriber Letter, I was unable to produce blogs. I’m back now and will have some edges to share this week. This is one study I found interesting from Sunday night’s Subscriber Letter. Pretty much everything I’m looking at short-term is suggesting a pullback. Longer-term that is not the case. I did a study looking at situations where historical volatility has contracted rapidly like it has in the last 3 days. For the study I looked at the 3-day historical volatility and compared it to the 10-day historical volatility 3 days ago. In other words I divided Friday’s 3-day historical volatility by Tuesday’s 10-day historical volatility. A result below 1 would indicate the last 3 days have been less volatile than the previous 10. A number above 1 would indicate a recent uptick in volatility. For the SPX, Friday’s 3-day over Tuesday’s 10-day came in at a very low 0.23. I then looked to see what the 3-day historical volatility has typically been 3 days later. What does a sharp contraction over the last 3 days indicate you might expect over the next 3 days? What I found is that when the 3-day over the offset 10-day dropped to 0.25 or lower the next 3 days were 5.5 times as volatile as the recent 3 days. This is based on 1,111 trading days since 1960 – or about 9% of all trading days. 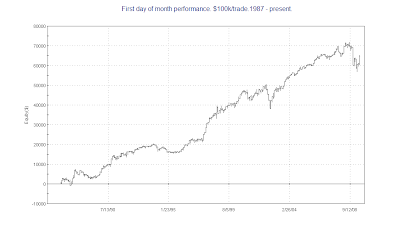 Going back to just 1999 gave similar results, as the 3-day historical volatility increased by 5.4 times. This suggests we may see some increased movement over the next few days. A breakout of the recent 3-day range could be very sharp. My studies indicated a bounce was likely yesterday. It arrived, but unfortunately it was another example of a weak bounce. Below is a study that looks at SPY bounces from lows that lack volume. The only instance that did NOT post a lower close within 3 days was just 2 weeks ago – on 6/23/09. Some technical problems this morning delayed my routine and didn’t allow me to post a fresh study before the market opened. I thought I would discuss a point I made in last night’s Subscriber Letter about the strongly bullish short-term study from Sunday night. The indication was that following a day like Thursday, the SPY had closed up strongly over every 1 and 3 day period. Monday closed marginally higher in the S&P 500, although the SPY closed down 1 cent. Compared to the other 7 instances that were identified in the study, Monday’s action was the weakest. This can serve as a warning sign. When the market doesn’t rally as it is supposed to it may be suggesting a move in the other direction. It may help some traders to think of such scenarios as they might failed patterns. Take a breakout for instance. When breakout from a triangle or other consolidation pattern fails, it can often lead to a sharp reversal in the opposite direction. The same concept applies to historical studies. When the market doesn’t do what it is supposed to, you need to reassess. Like any other type of analysis, historical analysis requires constant reassessment. The market isn’t static and your analysis shouldn’t be either. An average rise of over 2.3% the next day and nearly 4% over the next 3 days is substantial. It can be dangerous to draw concrete conclusions from results that only consist of 7 instances. On the other hand, when results are this overwhelmingly lopsided, it can also be dangerous to ignore them.